For those of us who like receiving free samples of things, Black Box is a new FREE sample box service. 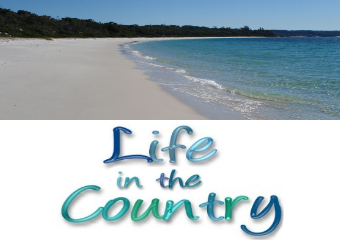 I first heard about it via Sydney Shop Girl, and I signed up right away. It was not long before my first box arrived. It was super exciting to unpack everything and see what is inside. I find I tend to get into a rut of using the same products over and over and it is awesome to try new things without having to lay out any $$. We have found some of our most favourite products thanks to samples – most notably my deodorant and Fairy Platinum which we are die hard fans of these days but never would have tried without a sample. So what do we have here? 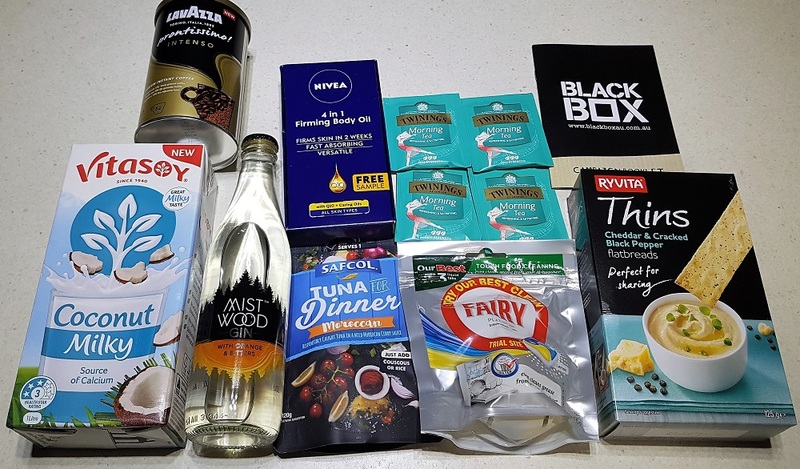 Lavazza instant coffee, Vitasoy Coconut Milky, Mist Wood Gin with orange and bitters, Twinings Morning Tea, Fairy Platinum dishwasher tablets, Ryvita thins in cheddar and black pepper flavour. We’re not instant coffee users for the most part but The Other Half does use it when camping and at work. We LOVE Lavazza coffee beans but they are Up Money so we don’t tend to buy them very often. This coffee is a nice compromise and they did not send a sample size. This is the full size product you can buy for $10.99 at Coles though it was $4.99 on special there last week. That is when I would likely buy it.. This coffee has a great flavour, very dark and intense which is how I love my coffee. I like this better than any instant coffee I have tried before and I have tried a lot of them. 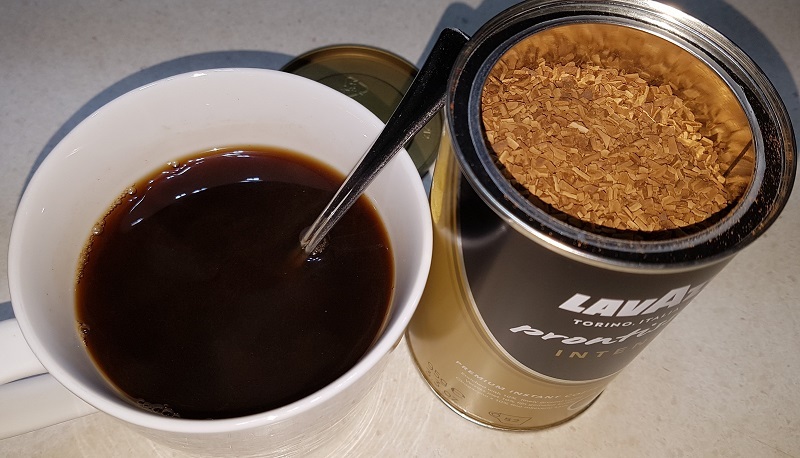 We buy 1kg of dark coffee beans from Aldi for $11.49 and that keeps us going coffee wise for quite some time – we get 100 cups of coffee out of 1kg of beans. If you instant and you like it dark, I think you would like this, especially if you can get it on special. I’m already a big buyer of Vitasoy products – in general we buy something like 5 litres of soy milk and 3-4 litres of almond milk each fortnight – overall I prefer using the products that one keeps in the fridge. It is very handy to have things like this UHT version in the cupboard as long as I remember to use them every now and then. I tend to use these UHT milks for cooking if we are running low on fridge milk. It is unusual for me to receive alcohol products in a box like this, but to be honest this is the only way a product like this has a chance of getting on my radar. I am not a big drinker of alcohol at all and I have never tried gin before. I may have an occasional lemon, lime and bitters if we go out – mainly because I like the bitters – and once in a blue moon I might drink a vodka cruiser of some kind, usually a cheaper Aldi version. I made sure to open this when The Other Half was here firstly because I have no idea how to open this kind of bottle and secondly so he could try it. The verdict was surprising to both of us. We quite liked it. 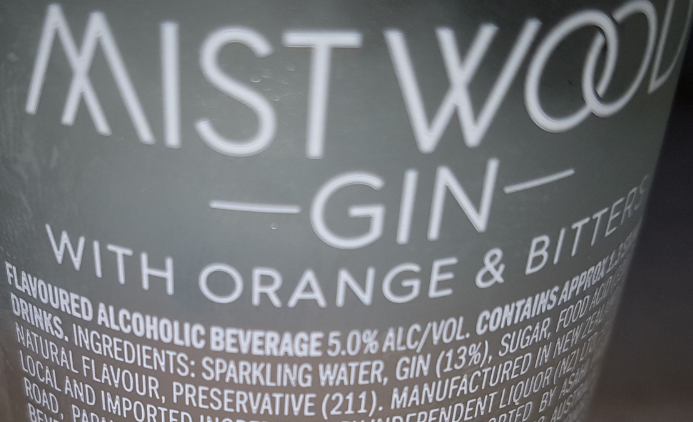 I’m not especially surprised that I liked it – except gin – because on reading the label the number one ingredient is my most favourite thing – sparkling mineral water. But that The Other Half liked it? That was a shock. The best thing about this drink was that it was very “dry” and not sweet at all to my tastebuds. I mostly drink mineral water because I find everything else far too sweet now. I will sometimes drink ginger beer, maybe once a month or so. I found the Nivea firming body oil to be fantastic and I will definitely be buying this when I see it on a decent special because $16.45 is up money BUT having said that I got several applications from the 8g sample size so I suspect value for money is high here. I hated trying to use it out of these sachets. I made a heck of a mess each time. If I’m going to have tuna for dinner it will likely be a pasta bake or tuna mornay. This was tasty but not something I would be likely to buy on the regular. During winter we usually have a cup of tea around 9pm. We usually drink Twinings for that cup of tea – Assam Bold is our choice. But I also sometimes have Nerada Chai. I wasn’t a huge fan of this new morning tea flavour but I could not put my finger on exactly why. I’m glad to have tried it and now I know it is not for me. The Fairy Platinum went straight into the dishwasher tablets container, joining 100 or so of their friends. Why do I like them so much? Not only do they clean the dishes beautifully but they clean the dishwasher as well. Squeaky clean. Like it will actually squeak. I like the idea of a flatbread so I was excited to receive these Ryvita ones. However the execution was far too peppery for me. And I LIKE pepper a lot. I have already received an email from Black Box saying my next box is on the way, so I will be excited to see what arrives! 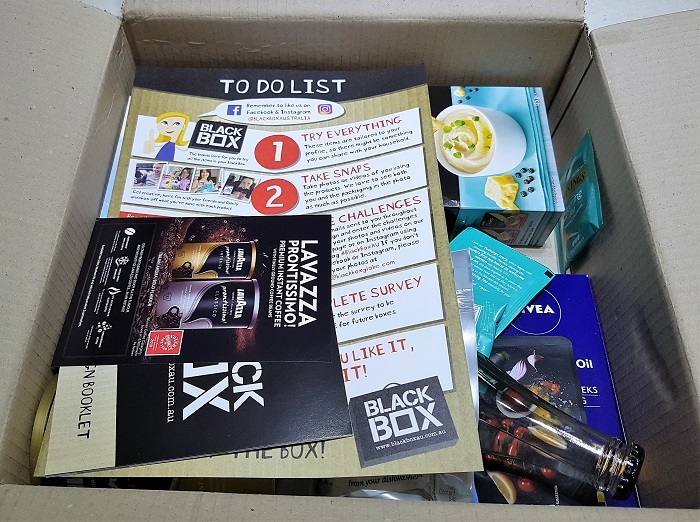 Everybody likes free samples so if you are in Australia or New Zealand you might want to sign up to receive your own box. I used to be a member of PinchME and I received quite a lot of samples via that format. However that site now does not exist in the format that it once did, and I have no idea what it is meant to be now. Ooh, I would love this … and would probably drive Jerry crazy. I wonder if they something like this in Spain. My mother would have been a member of every one. I’m so glad she didn’t know about it. 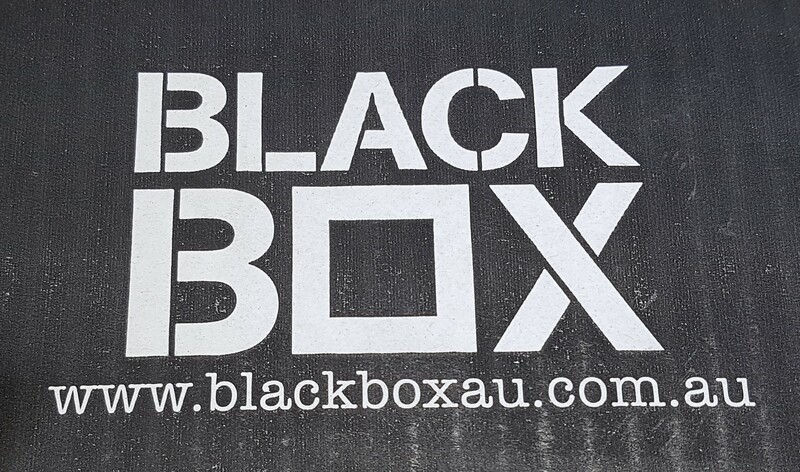 Thanks for the shout out and I’m glad you’re having fun with Black Box too.